Product #16051 | SKU TAA011CAN | 0.0 (no ratings yet) Thanks for your rating! 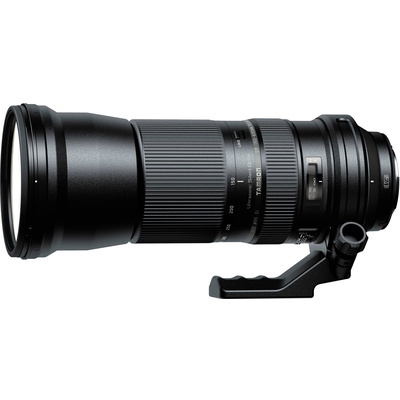 The Tamron SP 150-600mm f/5-6.3 Di VC USD Lens for Canon is an expansive telephoto-zoom lens designed for both full-frame and APS-C-sized image sensors. Its 4x zoom design covers standard telephoto to super telephoto perspectives, making it ideally suited to working with a wide variety of subject matter. Benefitting this range is VC (Vibration Compensation) image stabilisation, which helps to minimise the appearance of camera shake to enable the use of longer shutter speeds or smaller apertures when hand-holding in low-light conditions. A USD (Ultrasonic Silent Drive) autofocus motor provides quick and precise focusing performance, with high torque, low response times, and quiet operation to benefit both still and video applications. Additionally, a full-time manual focus mechanism enables manual fine-tuning of focus at any point, even when the AF system is engaged. The optical design integrates three low dispersion (LD) elements within its construction to minimise optical aberrations throughout the zoom range, particularly at the longer focal length positions. Individual elements also feature an eBAND (Extended Bandwidth & Angular Dependency) coating, as well as a conventional BBAR (Broad-Band Anti-Reflection) coating, in order to reduce lens flare and ghosting to produce more contrast-rich and colour-neutral imagery. eBAND and BBAR coatings have been applied to lens elements to minimise lens flare and ghosting in order to maintain high contrast, clarity and colour fidelity. VC image stabilisation helps to reduce the appearance of camera shake to enable greater hand-held shooting capabilities in low-light conditions. The optimised optical design reduces the movement of lens groups during focusing and zooming in order to maintain a relatively compact and lightweight form-factor.